When disaster hits some part of the World, the rest of the World’s attention span increases from three seconds to three minutes, as they watch the horror on TV. 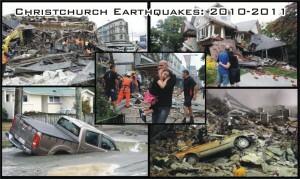 Yet, three years after our disaster, our lives are still feeling the aftershocks. An earthquake lasts a few seconds but for anyone who has never experienced one, you can never know the terror of the earth moving under your feet, of gaping cracks swallowing cars and spewing filthy sewage-poisoned liquefaction all over roads and gardens, of everything you own smashing to the floor as cupboards empty themselves and, of course, of whole buildings caving like a house of cards, killing people. And then for weeks, months afterwards: roads blocked and guarded by soldiers, the liquefaction dries and turns our crumpled city into a dust-bowl, people still have no power as Winter approaches, rows of smashed leaning houses, their homeless occupants elsewhere while low-life looters steal our unguarded precious belongings. What you also can’t possibly know is how life irrevocably changes years after the initial horror passes. As I sit in the lounge room of our temporary accommodation, a familiar shudder rocks our rental, making it creak, and nearly tipping over my coffee. I barely raise an eyebrow and think “Haven’t felt one of those for a while”. Meanwhile others around Christchurch are having guessing games as to the magnitude of the aftershock “I reckon about a 3″… “No, maybe 3.5”. We’ve had over ten thousand aftershocks! My dogs, as usual, look at me with worry and one of them almost slinks off to his safety zone behind the toilet, like he does every time a rumbling truck goes past or road diggers make sounds similar to ‘shocks. So, we’ve become accustomed to the occasional wobble and we’re used to never-ending roadworks, detouring us around the moon, and the thousands of kilometres of roads, yet to be repaired, giving us roller-coaster rides and making us sea-sick. But here my partner and I are: in a rental property after we’d sworn we’d never rent again. Our little house in Parklands, at the North-East corner of Christchurch, was to be our forever home. Three years after our house was bent and broken, it’s finally our turn to have it repaired. That will take five months. Finding a rental with less than a six month lease is hard enough but when you have two dogs… Not to mention greedy, profiteering landlords charging exorbitant rents because ‘The insurance companies are paying’. Yeah, right! Their handouts only stretch so far then it comes out of our pockets. Anyway, we’re very thankful we found a nice house with a fair landlord. We’re right next to a park and a forest walk, with the beach at the other end of the street. Our dogs are very happy with that. about a 2.5, I reckon. Good, solid content. I just passed this on 10/2/2016 to a fellow student who has been doing a little research of their own on this subject. To say thank you, she just bought me dinner! So, let me express my gratitude by saying: Thank you for the meal! 10/2/2016 paulseymour.com.au does it yet again! Very perceptive site and a well-written post. Keep up the good work! I’m gratified by the manner in which paulseymour.com.au deals with this type of subject. Usually on point, sometimes contentious, always thoughtful and also thought-provoking. Solid, well-researched content. I just now sent this on 9/15/2016 to a fellow student who’s been doing some work of his own on this topic. To show his appreciation, she just bought me lunch! So, I guess I should say: Thanks for the drink! 9/15/2016 @ 15:34:53 Like the website– extremely user-friendly and tons of stuff to think about! Excellent read. I just now sent this on 9/14/2016 to a classmate who has been doing some work of their own on the topic. To say thanks, they just bought me lunch! So, I should probably say: Cheers for the drink! 9/13/2016 paulseymour.com.au does it yet again! Quite a perceptive site and a thought-provoking post. Nice work! Good, solid content. I just now passed this on 9/12/2016 to a colleague who’s been doing a little research of their own on this subject. To say thank you, she just bought me a drink! So, I should probably say: Cheers for the drink! 9/12/2016 paulseymour.com.au does it again! Very thoughtful site and a well-written article. Thanks! Good, solid content. I just now sent this on 9/11/2016 to a fellow student who’s been doing some work of their own on this subject. To say thanks, she just bought me a drink! So, let me express my gratitude by saying: Thank you for the drink! Good, solid content. I just passed this on to a classmate who has been involved in some work of her own on the topic. To say thanks, he just asked me to have a drink! So, I guess I should say: paulseymour.com.au, thanks for the drink – LOL! Like this site– very easy to navigate and lots to consider! Like this site. Very easy to navigate and lots to consider. paulseymour.com.au does it again! Very informative site and a good post. Thanks! Thank you Eartha. Please ‘share’ the link and remember to go to Contact and fill out details to subscribe. Have a listen to some music samples, too, if you like.